The February 2019 issue is now available digitally and will be on the newsstands soon. 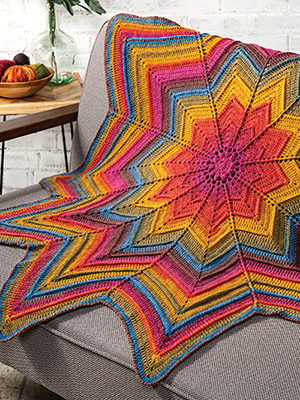 There are so many great projects in this issue, you may find yourself itching to get started immediately! 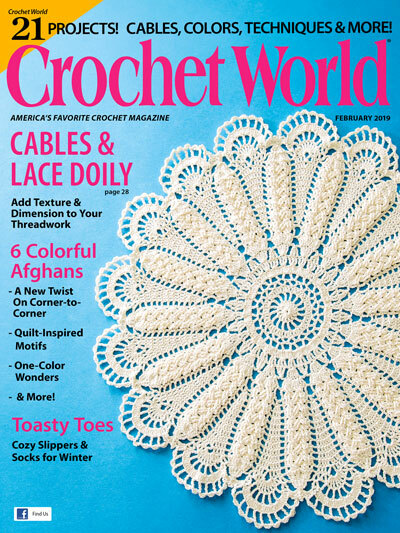 I love crocheted cables and in this issue you’ll find five stunning projects for every skill level. 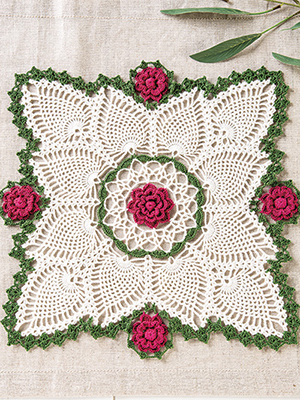 The Cables and Lace Doily on the cover is a challenging thread project for seasoned cable crocheters, but the results are spectacular! 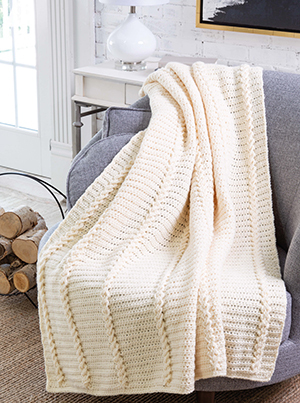 If you are a newbie to crocheted cables start with the Jacob’s Ladder Cabled Throw. 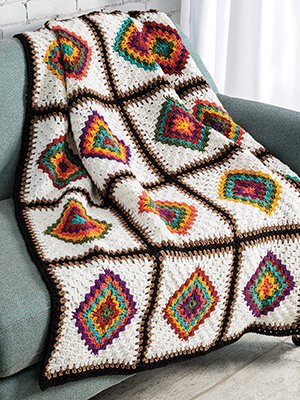 The cables are simply created by intertwining easy-to-make crocheted loops. There is even a step-by-step photo tutorial! 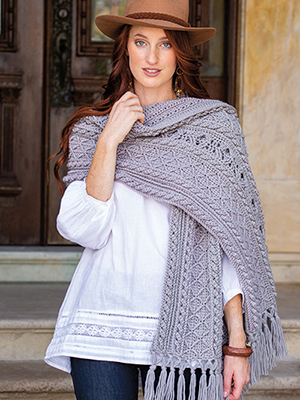 And one of my personal favs is the Celtic Diamond Wrap. I have my yarn at the ready and plan to get going on this project over the holidays! We’ve included a chapter with Socks, Slippers & More to keep everyone warm all winter long. Make a pair of cute Mary Jane Baby Booties for a favorite baby girl. Or how about a pair of Corded Ridge Socks for yourself? 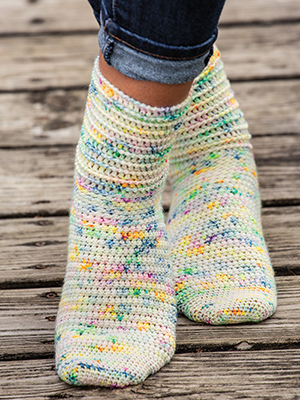 Crocheted using a fun hand-dyed speckle yarn, they are sure to make you smile every time you see them, and keep your toes toasty warm too! 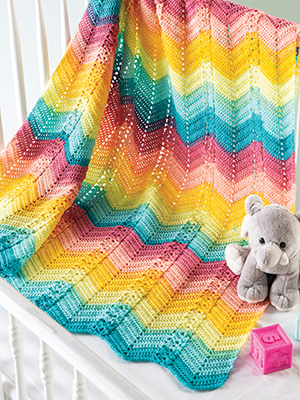 and a few more projects for baby including this Picot Shells blanket. 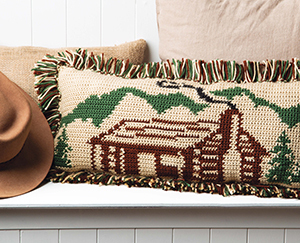 and a Rustic Cabin Pillow are just a few of the other projects you’ll find in this project-packed issue! Click here to see all 21 projects in this issue. And don’t forget to look for your copy at your favorite book or craft store beginning Dec 26. Can’t wait? Get a digital copy here! Or better yet, try a free issue on us!